So there is this blogger thing. It’s called What I Ate Wednesday. It was started by Jenn (who is awesome by the way). And I decided I wanted to jump on the train. I think it’s a great way to take a birds-eye-view of my eating habits & also try something… dare I say it… exciting on the blog? Yes. Yes, I do dare. I think this could be fun guys, so let’s hop on the WIAW train. I haven’t been able to get to the grocery store since I flew into Seattle at 12:30am on Monday, soooo I mainly ate purchased stuff/leftovers. This is actually What I Ate Yesterday, aka Tuesday. An everything (but mainly onion & garlic… yum… if someone could make a garlic onion bagel for me I’d be in heaven. You all know about my garlic obsession, this should come as no surprise. I have no regrets.) 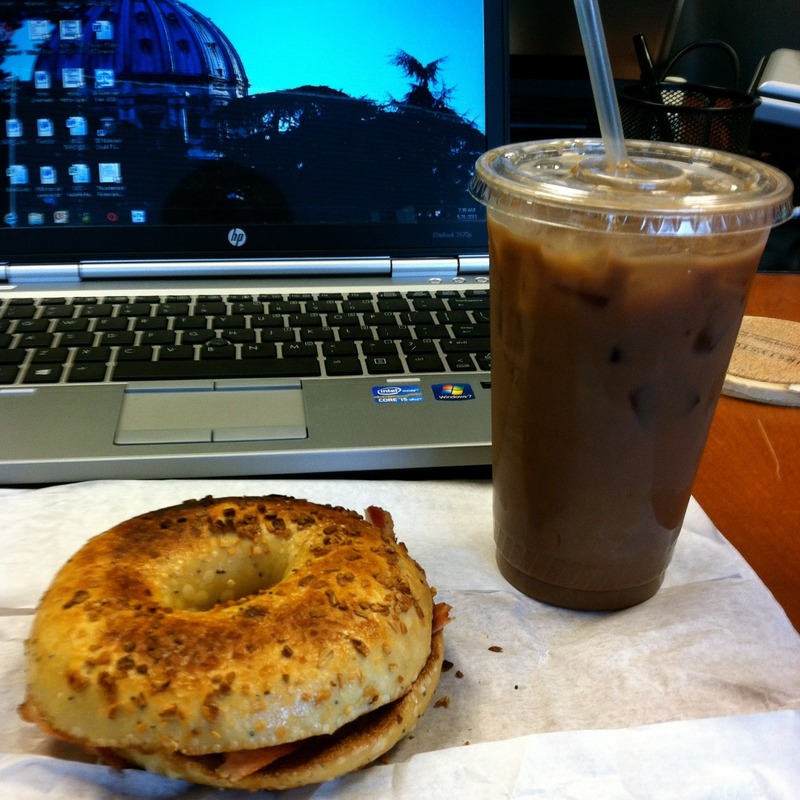 bagel with bacon. The nice man looked at me like I had four heads when I politely requested he NOT include egg and cheese. I ONLY WANT THE WORST PARTS SIR, the carbs & the grease… yum. Bring those bad boys on. I also had a venti mocha coffee… should have ordered an extra shot but you live and learn. Now this… this is where it’s at. I went over to Deb’s for dinner on Monday and she was kind enough to pack me some leftovers to take to work for lunch. I had marinaded flank steak (OMG TO DIE FOR.. I don’t remember the marinade but I can ask her) with broccoli & garlic bread. I was living the life. THANKS DEB, you’re amazing! I had dinner with Laura at Fonte Cafe. She had a coupon for a buy one get one free pizza there. She ordered the Margherita (which was delish) and I ordered the Salsiccia. Mine was really good, I added some crushed red pepper to it (on accident) which ended up being a really good choice. If i were going back I’d probably order the Margherita; but mine was still REALLY good. I’m eating my leftovers for lunch tomorrow.. I might throw a dab of sriracha (honestly the worst word to spell ever) on there before I head out the door, just sayin. No pictures of this, but I had a few pretzel m&m’s and two glasses of red wine with Laura while we watched The Voice. After I got home I munched on a few Saltines. I do really love those crackers. Nom nom. All-in-all it was a pretty successful day.